Plot Outline: This unflinching story begins when a plague of blindness strikes and threatens all of humanity. One woman (JULIANNE MOORE) feigns the illness to share an uncertain fate in quarantine, where society is breaking down as fast as the crumbling surroundings. 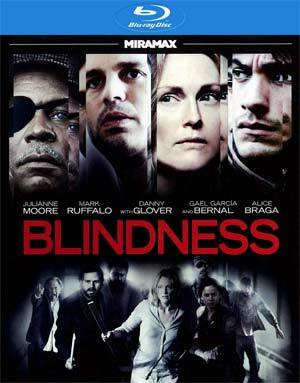 Quick Hit Review: Blindness is a film filled with great performances, especially from venerable actors Julianne Moore and Mark Ruffalo, and the story is quite interesting but at the same time it’s an ordeal to get through with drab and bleak settings to go along with a depressing plot which is both engaging and draining at the same time. Director Fernando Meirelles, along with his director of photographer Cesar Charlone, at least make a brilliant looking picture which rivals that of their most known collaboration, City of God. 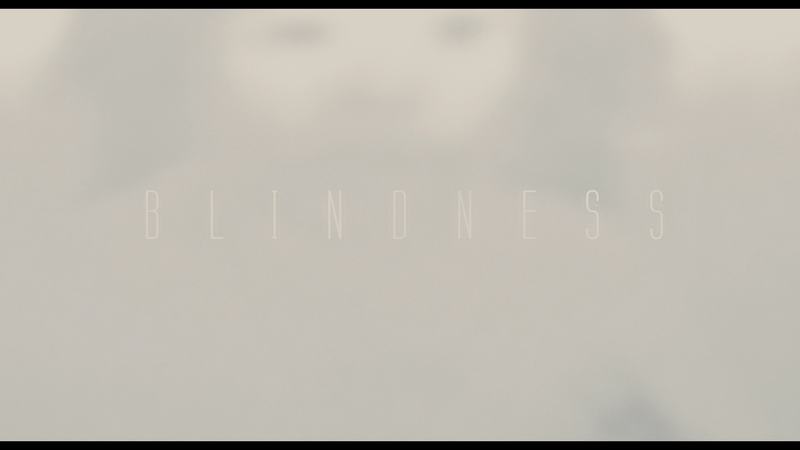 Blindness might not have been my cup of tea but I can still appreciate it for the visuals and the acting. The Seeing Eye (36:07; SD) – Much like the previous feature, this too provides much of the same behind-the-scenes shots but is more nuanced on the actual on-location shooting whereas the other was a bit more internal on the story. 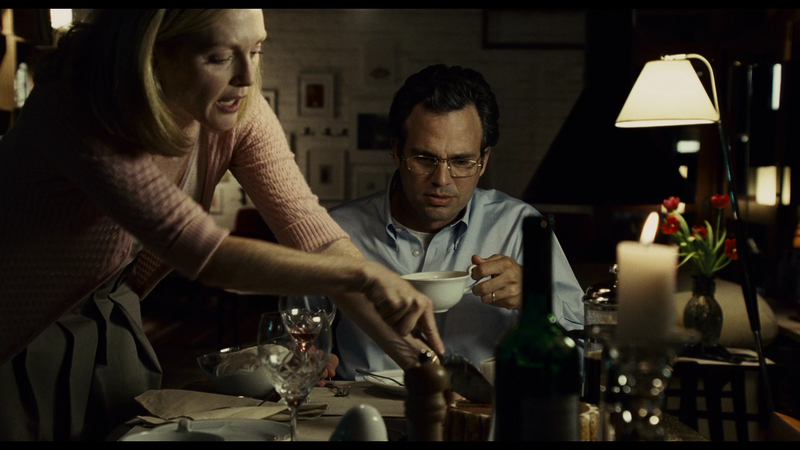 Extra Scenes (6:24; SD) – Included are scenes that, for various reasons, didn’t make the final cut. 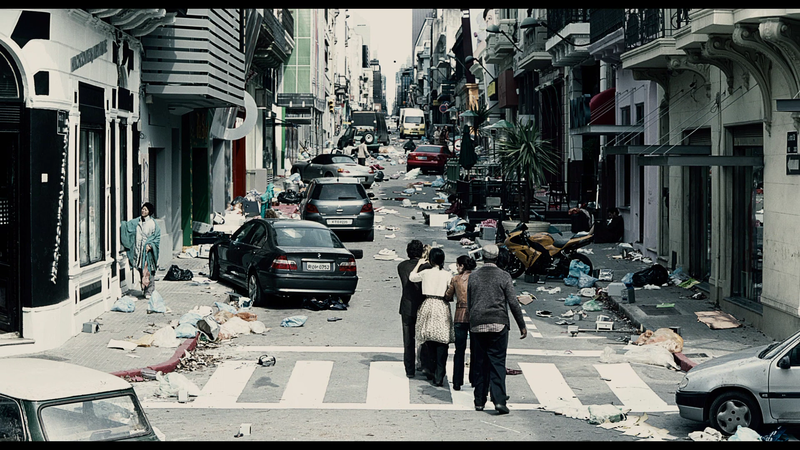 Blindness comes to Blu-ray presented in its original 1.85 widescreen aspect ratio (misprinted on the back as 1.78). The MPEG-4 AVC codec and 1080p transfer looks pretty good although I did notice the occasional dust marks. However, the level of detail was nice, black levels, when there was any since most a fair amount of the film is washed out, was also good. I won’t say it’s an amazing transfer but it’s probably a modest upgrade over the DVD version. It should be noted that most, if not all, of Echo Bridge’s Blu-ray releases are mislabeled on the back. This was the case here where it said the audio was “English 5.1 DTS” and “English & Spanish 2.0” when in fact all three language tracks are lossless DTS-HD MA. The track here sounds, for the most part, great with clear dialogue and whenever the movie picks up pace, some well defined audio coming from the front and rear channels. Overall, Blindness might not have been my kind of movie but I appreciate it for the fine performances, excellent cinematography and a story which is at least captured my attention for the film’s duration. The Blu-ray itself has two fantastic featurettes which will give insight into almost every aspect of the film. This goes along with adequate if not good video/audio transfers making this cheap title worth picking up.